The trees along Estes Park’s Elkhorn Avenue were leafing out, but we hopped in the car and headed for Trail Ridge Road in Rocky Mountain National Park. The road opened last week and we wanted to see the snow. At Rainbow Curve we gazed down at the Horseshoe Park, where the snow had melted and the aspen trees were beginning to show their colors. The chipmunks gathered at our feet looking for handouts. Back on Trail Ridge Road, we were soon at treeline looking up at 19-foot cliffs of snow. The Park’s rotary snowplows have been working since April to clear the road and several plows were parked by the side of the road in case the weather turned bad. It snows every month on top and often the road must be closed until dangerous conditions improve. This year the opening of Trail Ridge was pushed back a day because of 20-degree temperatures and blowing snow. In the distance, the ground was snow-covered with occasional patches of bare, windswept tundra. We stopped at Rock Cut and gazed at the layers of whipped cream snow that covered the Never Summer Range. Though the temperature was in the low 40s the brisk wind made it seem colder. We put on windbreakers and those wearing shorts wished they had brought long pants. At more than two miles above sea level we struggled to catch our breath. But the thin air was fresh, invigorating. A few adventurous souls scrambled over the snow to the Toll Memorial trail, but we headed west past more snow drifts to the Alpine Visitor Center. National Park workers had carved “NPS 100” in a massive snow pile to celebrate the National Park System’s Centennial. Parents and their children crawled upon the giant letters for that memorable photo. On the way down we stopped for a picnic at Hidden Valley. The sun appeared from behind clouds and the grass was turning green. It seemed impossible that there were snowdrifts only miles away. 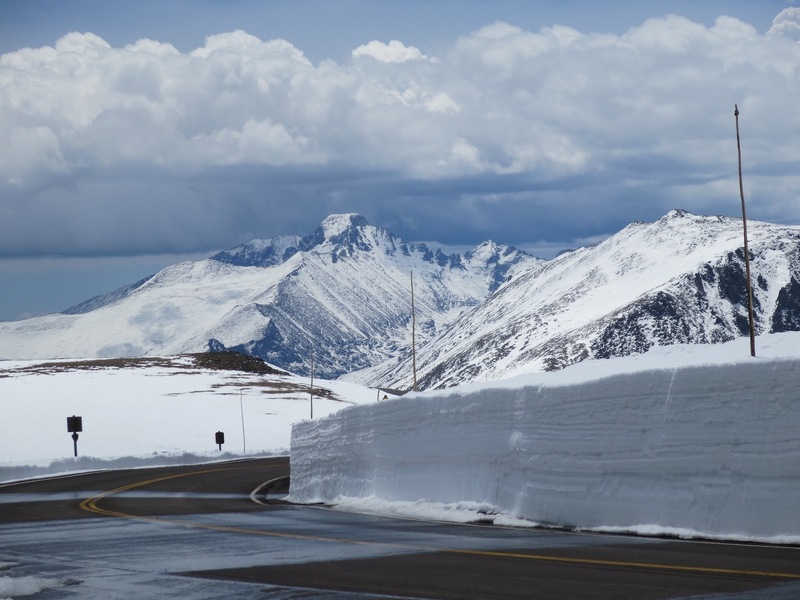 This is the magic of Trail Ridge Road in June.